The original old stone house of the fourteenth century. was recently restored to offer hospitality in 6 beautiful apartments with all mod cons. The farm is located within one of the most typical country of Tuscany, Volterra hills. From the infinity pool and the apartments of the farm you can enjoy an extraordinary panorama of the Tuscan countryside. The hills will give you scenarios and different colors with the seasons. The’farmhouse is ideally located to visit Volterra only 14 km far and Tuscan beaches 25km far. 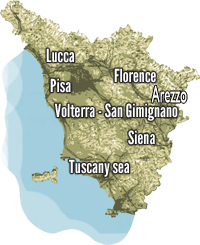 The art cities of Pisa, Siena, Lucca are within about 1 hour by car. The food, restaurants and services of all kinds are about 2km from the farm. Inside the house also live Eugenio and his wife, the owners, who are always ready to meet your needs. Holiday in this lovely farmhouse is particularly recommended to lovers of peace and lovers of photography and painting. Price accommodations include: kitchen linen: kitchen towels, tablecloths, towels, bed linen (pillowcases, sheets, pillows, blankets), cooking gas, electricity, water, swimming pool 12mx6m H 1.5 m (open from mid May to mid September), Currency bed linen / towels weekly.